Saint Anna, the mother of the Most Holy Mother of God, was the youngest daughter of the priest Nathan from Bethlehem, descended from the tribe of Levi. 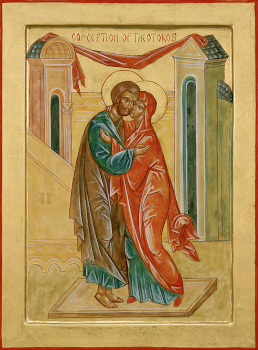 She entered into marriage with Saint Joachim (their mutual memory is made 9 September), who was a native of Galilee. For a long time Saint Anna was childless, but after a span of some twenty years, through the fervent prayer of both spouses, an Angel of the Lord announced to them the Conception of a Daughter, Who would bring blessing to all the human race. The Conception by Saint Anna took place at Jerusalem, where also was born the Most Holy Virgin Mary by name. There also exist icons, upon which Saint Anna holds on her left arm the Most Holy Virgin at an infant age. Upon the face of Saint Anna is portrayed a special reverence. An ancient icon of large size, written on canvas, is located in the village of Minkovetsa in the Dubensk district of Volynsk diocese. And from ancient times this feast was especially venerated in Russia by pregnant women. Previous Previous post: Science of the Saints, 21-XII-2018 (8 Dec.), Our Venerable Father Patapius. Next Next post: Science of the Saints, 23-XII-2018 (10 Dec.), The Holy Martyrs Menas, Hermogenes, and Eugraphus.